When Quakers gather to make decisions, they do so with the hope of being called into unity by the loving Spirit who guides their steps in the practice that Friends call “meeting for worship with attention to business.” But too often that sense of unity and sure guidance are elusive, and instead Friends experience impatience and frustration. 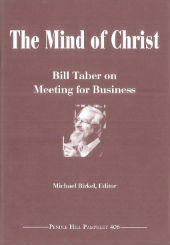 The late Bill Taber, a teacher and spiritual guide beloved to many Friends, addressed the rewards and challenges of Quaker business process in a number of presentations to Friends groups. Quaker scholar Michael Birkel has edited Bill’s notes for these talks into an inspiring and helpful essay on how Friends can carry into business meeting the practices and attitudes that open the way to Spirit-led decisions in our communities. Discussion questions included. Michael Birkel teaches in the Religion Department at Earlham College in Richmond, Indiana, where he also directs the Newlin Center for Quaker Thought and Practice. He has traveled widely among Friends as a lecturer and workshop leader. He is the author of the Pendle Hill pamphlet The Messenger That Goes Before: Reading Margaret Fell for Spiritual Nurture (#398). His other writings include an introduction to Quaker spirituality entitled Silence and Witness, a study of John Woolman’s spirituality, A Near Sympathy, and an exploration of early Quaker meditative reading of the Bible, Engaging Scripture. His most recent book is Genius of the Transcendent: Mystical Writings of Jakob Boehme, which explores the spirituality of a German mystic whom some earlier Friends read with appreciation. Michael is also active in interfaith relations, particularly Muslim-Christian dialogue.